If the above building looks familiar to you, here is why: I learned it was owned by my landlord after he had been shut down by the Department of Buildings, discovered this web site and elected to telephone me. Needless to say this was a bit awkward. 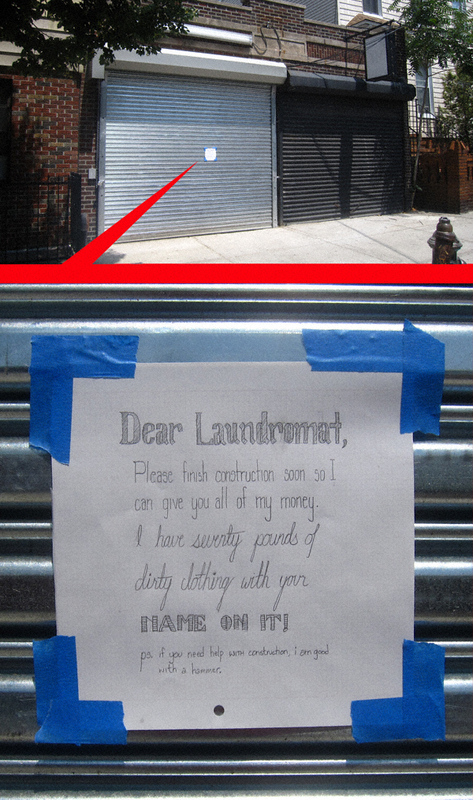 But not as awkward as, say, having seventy pounds of fetid laundry in your apartment. Although I miss the purple aluminum siding, perhaps it “died” for a good cause? I suspect this person’s neighbors or roommates would say so. In closing I would like to advise the person responsible for this tome that am going to print out a copy of this and give it to my landlord lest he is need of anyone who is “good with a hammer”. His name is Nick lest you want to put his name on your dirty clothing.